Now we’re heading out for 24 hours at the beach. Yes, I know it is cold. It’s still nice there. and it looks mahvelous on you!! have enough fun at the beach for me too!!! 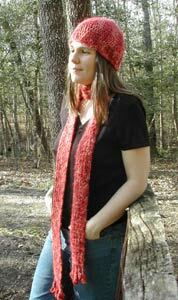 cute hat and scarf and your so young looking! I thought you were older for some reason. cute, cute, cute! I love to go to the beach during the off-season (it’s the “perfect” season for me!). Lookin’ good! Have some big fun at the beach! Oh, you know it’s cold! ;) Be sure to take your hat and scarf!